in a pressure cooker, steam blows off through a built-in safety valve to level off or reduce the pressure. If there were no safety valve, the pot would explode. 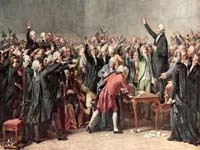 This is what happened in 1789 in France. For two and a half centuries, social and religious abuses caused immense anger to build up. This culminated in the long, bloody revolution foretold in the book of Revelation almost seventeen hundred years before this incredible event took place. For students of the book of Revelation, the strikingly detailed fulfillment of this and other prophecies confirms God’s greatness and His desire to communicate with us. “Blessed is he who reads and those who hear the word of this prophecy, and keep those things which are written in it; for the time is near” (Revelation 1:3). About A.D. 98, the apostle John (John 13:23), writer of the Revelation, remained unharmed even after he was dropped into a cauldron of boiling oil. Frustrated, Emperor Diocletian banned the apostle to the island of Patmos so he could not preach. But there Jesus gave John seven visions that have taught all Christendom for nineteen hundred years. “We can do nothing against the truth, but for the truth” (2 Corinthians 13:8). 1. Where does the prophecy about the French Revolution begin? “I will give power to My two witnesses, and they will prophesy one thousand two hundred and sixty days, clothed in sackcloth” (Revelation 11:3). 2. Who are God’s two witnesses? “For the word of God is living and powerful” (Hebrews 4:12). Jesus said, about the Scriptures, “these are they which testify of Me” (John 5:39). The Old Testament Scriptures promise that He would come. The New Testament Scriptures confirm that He did come. The two witnesses are the Old and New Testaments personified. 3. How do the Old and New Testaments prophesy in sackcloth for 1,260 days? To “prophesy” means to speak under inspiration. Explaining the Word is called “prophesying.” The Hebrews expressed their sorrow by wearing sackcloth. (Remember Daniel praying in sackcloth in Lesson 9?) The 1,260 days is the same 1,260-year period that we learned about in Daniel 7 (Lesson 8), referring to the time of papal supremacy from A.D. 538 to 1798. During the Dark Ages, that “great tribulation” foretold in Matthew 24, for a common person to possess a Bible or teach it was a crime punishable by death. Thus it can be said that the Scriptures prophesied in sorrow for 1,260 days. 4. What happened toward the end of this 1,260-year period? “When they finish their testimony, the beast that ascends out of the bottomless pit will make war against them, overcome them, and kill them” (Revelation 11:7). In 1793, France threw off the yoke of the medieval church–but did not stop there. A new France emerged. “The First Republic,” described in the above verse as “the beast that ascends out of the bottomless pit,” officially denied the existence of God and banned, collected, and burned Bibles. The new France also abolished religion, marriage, the so-called Christian calendar, and all other institutions connected with religion. Instead of liberating the two witnesses, this beast killed them. 5. How does the prophecy symbolize the treatment the two witnesses received? “And their dead bodies will lie in the street of the great city …” (Revelation 11:8). Rioters tied a Bible to a donkey’s tail and, with mockery and cheers, led the animal through the streets of Lyons. “Dead bodies” lying “in the street” fitly symbolize all the demonstrations of contempt for the Bible that were celebrated in the streets of France. “… Which spiritually is called Sodom …” (Sodom was notorious for its immorality) is a phrase that fitly symbolized France, where marriage was dubbed the “sacrament of adultery,” families were dissolved, and licentiousness ran rampant. An ill-reputed actress was crowned the nation’s “Goddess of Reason” at the high altar of the cathedral of Notre Dame. The words “… and Egypt,…” depict how the French Revolution repeated Pharaoh’s bold defiance of God. Exodus 5:2. Also fulfilled were the words “… where also our Lord was crucified.” At one point the crowd surged through the streets carrying a large picture of Christ crowned with thorns. Across the picture were written the words “Crush the Wretch!” Truly, our Lord was freshly crucified in France. Hebrews 6:6. 6. How did the surrounding European nations react to the Revolution? “Then those from the peoples, tribes, tongues, and nations will see their dead bodies three and a half days, and not allow their dead bodies to be put into graves. And those who dwell on the earth will rejoice over them, make merry, and send gifts to one another, because these two prophets tormented those who dwell on the earth” (Revelation 11:9-10). The central and northern European countries, horrified at this assault on God and decency, continued to preserve the Word of God. 7. How long did this terrible rebellion continue, and how were the two witnesses “brought back to life”? 8. After that, what treatment did these witnesses receive? The venture was so successful that today the Bible is the all-time universal bestseller. God’s–not Voltaire’s–prophecies came true! 9. How does the prophecy sum up the events described above? “And the same hour was there a great earthquake, and the tenth part of the city fell, and in the earthquake were slain seven thousand [names of men]: and the remnant were affrighted, and gave glory to the God of heaven” (Revelation 11:13 KJV, footnote). France, one of the ten kingdoms that rose out of western Rome, had been the most loyal daughter of the Papacy, “that great city” (Revelation 17:18)–a “city” notoriously corrupt. But in embracing atheism, France went “out of the frying pan into the fire.” When the oppressed masses blew their top, the carnage was fearful. And, as foretold, seven thousand titles (L.R. Conradi, Die Offenbarung Jesu [The Revelation of Jesus], Internationale Traktatgesellschaft in Hamburg, Germany, 1904, p. 277) belonging to nobility, royalty, and clergy were abolished. But individuals and nations had learned important lessons. The survivors acknowledged the need for God in their affairs. 10. Can anything good come out of terrible and terrifying events? “Surely the wrath of man shall praise You; with the remainder of wrath You shall gird Yourself” (Psalm 76:10). “Suffering,” someone wisely said, “is the greatest teacher of mankind.” Considering the severe oppression endured for centuries, it is easy to understand how the pent-up frustrations of the French finally exploded with a vengeance. Regrettably, they threw God out with their oppressors. This cost the people of France dearly. Yet, by God’s grace, good came out of this horrible event. Nations learned, and people went back to the Bible to find truth. What about … THE LESSONS OF THE FRENCH REVOLUTION? What are some of the valuable lessons you and I can learn from this fearful event? a) Religious oppression leads to atheism. b) It’s dangerous to deny God’s sovereignty and benevolence. c) “We can do nothing against the truth, but for the truth” (2 Corinthians 13:8). Just as determined efforts to keep John “the revelator” from preaching the gospel signally failed and resulted only in a great work done for God, so France’s war on the Bible resulted only in its unprecedented popularity. d) “Do not be deceived, God is not mocked; for whatever a man sows, that he will also reap” (Galatians 6:7). Cause is followed by effect in nations as well as in nature. e) “The truth shall make you free” (John 8:32). The church was able to oppress the people because they didn’t have the Bible, which proclaims liberty for all. f) “Be ready, for the Son of Man is coming at an hour when you do not expect Him” (Matthew 24:44). As the last crises develop, we, and everyone else in the world, need to prepare spiritually so that we don’t blow our tops before Christ returns! the book is prophetic. Readers will be prepared for what is coming. whoever first deciphers its mysterious content claims the promised blessing. an uproar without a cause. a reaction to way too many abuses endured too long, by too many people. the result of Rome’s misrepresenting true religion. the Old and the New Testaments personified. the apostles Peter and Paul. they gave their testimony during persecution. the Bible was wrapped in sackcloth during the persecution. they were highly honored by church and state. defied God, mocked the Bible, and venerated adultery. overthrew the abusive medieval church and restored the Bible. 7. How long did the bodies of the two witnesses lie in the streets? Until the end of the 1,260 years, in 1798.
the Bible was given a place of honor. people saw that nothing good came from it. Christians translated and distributed the Bible worldwide.